Rustam Qobil examines Islam in Afghanistan, taking a closer look at the Sufi and Shia minorities. For the second part of his series for Heart and Soul, Rustam Qobil investigates the lives of Shia Muslims in Sunni-dominated Afghanistan. While the two main Islamic groups, the Sunnis and Shias, are in conflict in many other Muslim countries, the Afghan Shias have been enjoying newly-acquired rights, equality and opportunities in this complicated country. Shia Muslims are the second-biggest religious group in Afghanistan and have been the most-oppressed minority in this country's recent past. Although it has never resulted in large-scale sectarian violence, relations between the majority Sunnis and minority Shias have historically been tense. But now Afghans say that they want to build peaceful and friendly relations in their war-torn country and have met with Shias to discuss how to make it happen. After years as an almost non-existent political force and living on the fringes of Afghan society, the Shia are now represented by more than 50 MPs in the Afghan parliament. Some argue that centuries-long oppression and living in radical Sunni society might have made them more determined and progressive. Others say that long years in exile as refugees in neighbouring countries made them realise the power of education. But now as foreign troops are leaving Afghanistan many Shia Muslims are nervous of the ongoing sectarian violence between Shias and Sunni in neighbouring countries, and fear that the violence may spill over into Afghanistan. Rustam meets the Shias of Afghanistan to explore the life of this community, and also talks to Sunnis who have defied traditional boundaries in this divided society and married a Shia or converted to Shia Islam. 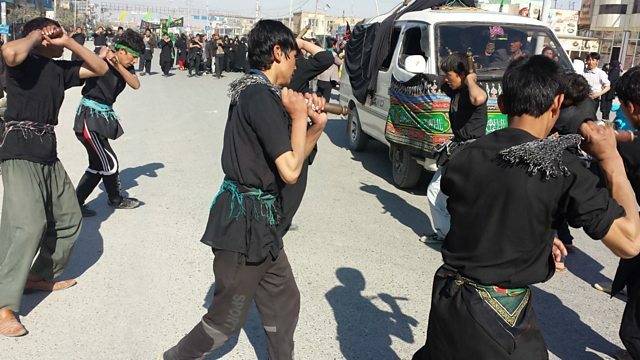 Image shows Shia Muslims of Afghanistan flailing themselves in the street.